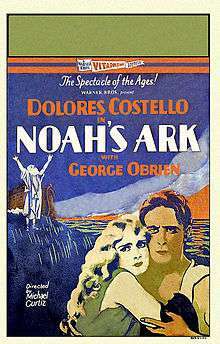 Noah's Ark is a 1928 American romantic melodramatic disaster film directed by Michael Curtiz and starring Dolores Costello and George O'Brien. The story is by Darryl F. Zanuck. 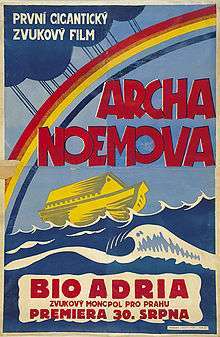 The film was released by the Warner Bros. studio. It is representative of the transition from silent movies to "talkies", although it is essentially a hybrid film known as a part-talkie, which used the new Vitaphone sound-on-disc system. Most scenes are silent with a synchronized music score and sound effects, in particular the biblical ones, while some scenes have dialogue. John Wayne and Andy Devine were among the hundreds of extras in the flood scene. Wayne also worked in the prop department for the film. During the filming of the climactic flood scene, the great volume of water used was so overwhelming (600,000 gallons) that three extras drowned, one was so badly injured that his leg needed to be amputated, and a number suffered broken limbs and other serious injuries, which led to implementation of stunt safety regulations the following year. Dolores Costello caught a severe case of pneumonia. Thirty-five ambulances attended the wounded. ↑ Baxter, John O. (1974). Stunt; the story of the great movie stunt men. Garden City, N.Y: Doubleday. ISBN 0-385-06520-5. ↑ Vogel, Michelle (2010). Olive Borden: The Life and Films of Hollywood's Joy Girl. Garden City, N.Y: Mcfarland.